STARKVILLE, Miss. (AP) — There’s little question that Lamar Peters has the floor vision and defensive ability to be one of the best point guards in the Southeastern Conference this season. If his shot starts falling like it did on Monday night, the ceiling might be even higher. Peters and Nick Weatherspoon both scored 17 points, freshman Reggie Perry added 16 points and 11 rebounds and No. 25 Mississippi State cruised past Alcorn State for an 88-65 victory. Peters had his most efficient offensive game of the season, making 6 of 9 shots from the field, including 5 of 8 from 3-point range. He added seven assists and three rebounds. The accurate long-range shooting was a welcome change from his first five games, when he made just 8 of 33 (24.2 percent) shots from behind the arc. The entire Mississippi State offense played at a high level, shooting 33 of 54 (61 percent) from the field. Weatherspoon shot 6 of 10, including 2 of 3 from 3-point range. Alcorn State (1-6) was led by Deshaw Andrews, who scored 26 points. The Braves shot just 37.3 percent from the field, but were hurt by their inability to guard the Bulldogs. 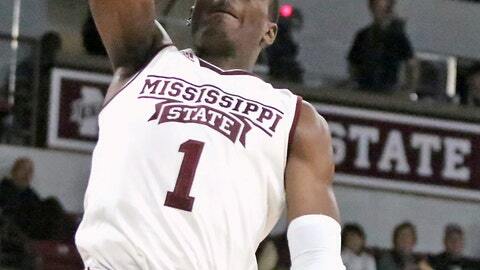 Mississippi State forward Abdul Ado missed his second straight game with a foot injury. He started the first four games of the year and averaged 4.3 points and 6.8 rebounds. Howland said he wasn’t sure when Ado would return to the lineup, but didn’t rule out the possibility he could play against Dayton on Friday. Alcorn State: The Braves had some good moments, but let the Bulldogs have way too many wide open looks. Alcorn State’s schedule should get easier over the next two weeks with games against Rust College, Champion Christian and Fisk University. Mississippi State: The Bulldogs were sloppy early, but cleaned things up and cruised to the easy nonconference win. Mississippi State’s good performance from 3-point range (11 of 24, 46 percent) was an encouraging sign after shooting just 26.2 percent beyond the arc over the season’s first five games. “The reason we were shooting such a poor percentage from the 3-point line is we were being rushed and anxious to get it going, instead of letting it come to you and be patient,” Mississippi State coach Ben Howland said.